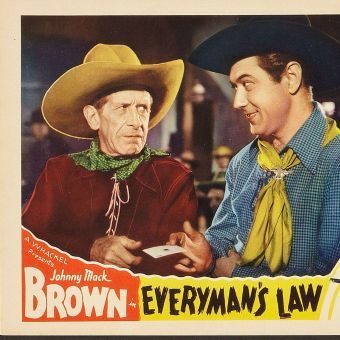 Former All-American halfback Johnny Mack Brown was a popular screen cowboy during the 1930s. Already in the public eye for his athletic prowess, Brown was persuaded by a friend to give Hollywood a try after graduating from the University of Alabama. In 1927, the muscular macho man was signed by MGM where he played in a number of leading roles opposite popular actresses such as Garbo, Pickford, and Crawford for several years. But Brown never really found his acting niche until he starred in King Vidor's Billy the Kid (1930). From then on he was happily typecast as a cowboy actor, and became a hero to millions of American boys, appearing in over 200 B-grade Westerns over the next two decades. 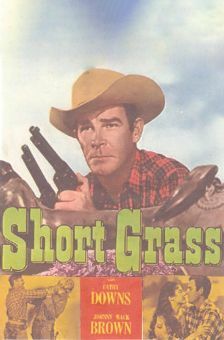 From 1942-50 he was consistently among the screen's ten most popular Western actors. 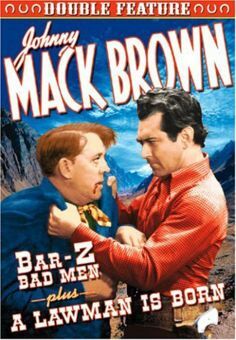 Brown formally retired from movies in 1953 but made occasional return appearances as a "nostalgia" act.